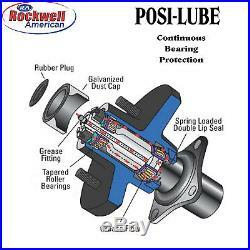 Rockwell American Axles Come With a Superior Powder Coated Finish and Posi-Lube Spindles to Ensure Continuous Bearing Protection. This Utility Trailer Parts Kit can be Modified to Suit Your Needs. 1 - 3,500 lb Idler Axle w/Hubs, Bearings, Lugs & Nuts (73" Hub face, 58" Spring Centers) 5Lug on 4.5" Bolt Pattern (545) 1 - U-Bolt Kit, Round - Includes: U-Bolts, Plates, Washers & Nuts, Boxed 2.375"x5.5x. 5"-20 1 - Hanger Kit, Single, Double Eye, 3.5-7K, Boxed 2 - Double Eye Springs 1.75", 1.75K, 4 Leaf, 25.25" I To I, 3" Arch. 5625" Eye 2 - Single Fenders (Reg 09.00W 032.00L 048.00 1"RF 15.00H 16.00R 16Ga CR) 2 - Fender Backs, Pre-Cut (12"x30.5" 16Ga) Fits 32" 1 - A-Frame Coupler For 2" Ball, 5K Capacity 1 - Tail Light, Square Stud Mount w/ Side Marker, Red, Right Side 1 - Tail Light, Square Stud Mount w/ Side Marker, Red, Left Side 1 - 20' Wire Harness, 4-Way, Flat Plug 2 - Amber Clearance Lights, Rectangle Stud Mount 1 - Safety Chain, 5.2K Capacity w/2 Hooks. 25"x48" 1 - A-Frame Jack, Top wind, 2K Capacity, 14" Lift, 8"H Bracket. This kit includes all components necessary to build/ revive your own trailer except for the steel framing, wheels and tires. This kit is for a 5' wide trailer. The drawing of the trailer shown in our photos is just an example of the trailer this kit is designed for, The trailer and/or blueprints are not included, Just the parts kit. 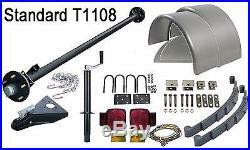 Engineer Approved Blueprints For Trailer Parts Kit - Model T1108. 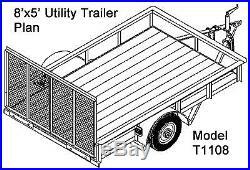 5x8 Utility Trailer Plans Blueprints - Model T1108. 14 Easy Step by Step Detailed Instructions with Welding Tips and Cut List Full Sized Engineered Approved Trailer Blueprints (24x36) Suitable for High School Shop Classes, Industry, and Do-It-Yourselfers. Features : 2,000 lb or 3,500 lb Axle Option, 2 ball coupler, top wind jack, single axle w/ leaf spring suspension, folding rear steel gate/ramp combo w/ optional wooden tailgate, heavy duty design, proven towing ability. 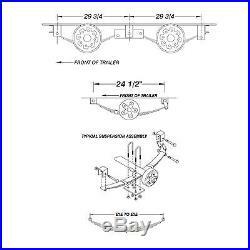 The item "Utility Trailer Parts Kit 3.5K Trailer Axle 73 HF/58 SC Model T1108 S" is in sale since Thursday, May 12, 2016. This item is in the category "eBay Motors\Parts & Accessories\Boat Parts\Trailer Parts". 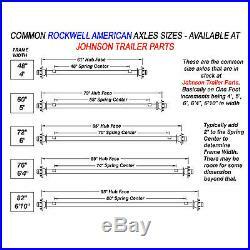 The seller is "johnsontrailerparts1911" and is located in Phoenix, Arizona. This item can be shipped to United States, Canada, United Kingdom, Denmark, Romania, Slovakia, Bulgaria, Czech republic, Finland, Hungary, Latvia, Lithuania, Malta, Estonia, Australia, Greece, Portugal, Cyprus, Slovenia, Japan, China, Sweden, South Korea, Indonesia, Taiwan, South africa, Thailand, Belgium, France, Hong Kong, Ireland, Netherlands, Poland, Spain, Italy, Germany, Austria, Russian federation, Israel, Mexico, New Zealand, Philippines, Singapore, Switzerland, Norway, Saudi arabia, Ukraine, United arab emirates, Qatar, Kuwait, Bahrain, Croatia, Malaysia, Brazil, Costa rica.